30 Boxes is an online calendar application that is targeting the mainstream consumer market who until now have not adopted calendaring online or offline. 30 Boxes is another contender in a very crowded market (as previously noted on Techcrunch) which has recently confirmed Google as the latest entrant (also seen on Techcrunch). 30 Boxes has some strong differential points and the team has implemented some great ideas that make online calendaring simple to use. I have been using it for over a week now as my primary scheduler and have been impressed enough to continue to use it. My previous attempts at online calendaring using some of the other apps now available (Kiko, CalendarHub and Airset) all failed after a few days, but 30 Boxes is hanging in there for me. There are a few reasons why, and they are good differentials that 30 Boxes has over the current competition. The first is natural language schedule additions – how this works is to add a meeting or appointment I enter something like ‘meeting with investors at 3pm tomorrow’ and it will create that meeting. If I wish to invite somebody else to the meeting I add +friend@friend.com to that string and it will send them a notification. This might sound complicated to learn but with the random examples below the entry box you quickly pick it up and get to learn what can be done. The interface itself is very simple – it is a calendar view and you can click on any day to view appointments (which can also give you a print view – handy when you want to print out your appointments for the day and take them with you) or easily edit the details or add further detail. 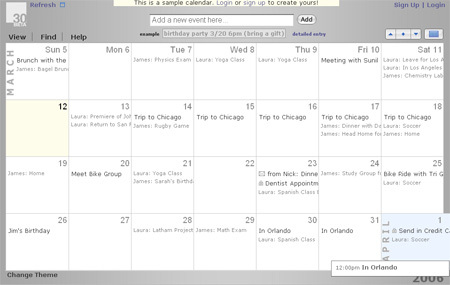 You calendar has a private view (which you see), a shared view (your buddies view of what appointments they have with you) and a public view (to include in your blog or anywhere else, you can mark appointments as public/private). It was a combination of the nice interface, usability and these simple features that have made 30 Boxes my default calendar now. I can see why they already have 22,000 users and adoption outside of the usual early adopter circle. More advanced users will enjoy the complete openness of 30 Boxes – they are rolling out an open API that allows full unrestricted access to your calendar, allow ‘remote skinning’ (ie. Skin your calendar with CSS files that are hosted on another server), they are commited to supporting greasemonkey scripts and have made it easy for them to be developed and have full open syndication of your profile and your metadata. This openness has already seen some mashups and plugins developed such as a Firefox plugin for adding items to your schedule, Outlook integration and developer libraries for a number of development languages and environments. In your profile you can link in your profiles from other sites (Flickr, LinkedIn, MySpace etc.) and with open syndication 30 Boxes can become your primary profile on the web that can be used in other applications. This is the beginnings of a social network that 30 Boxes are aiming to build around their application that will be completely open. One issue that I had was with timezones, since I skip between timezones frequently I have some issues such as when I fly from Australia to the USA and go back in time, but an upcoming feature will allow me to add the timezone of an appointment so the calendar will be able to sort it out. This is a complex problem that 30 Boxes is tackling but people that are in my circumstance do not make up a large portion of their user base. 30 Boxes has been developed by 83degrees, a California based company. The founders of 83degrees are Narendra Rocherolle, Nick Wilder and Julie Davidson who were prior founders and made up the management team of Webshots (which was sold to Excite@Home in 1999, and the repurchased in 2001, and then sold again to CNET in 2004). They are experienced in user interface design and building apps that will appeal to everybody from a casual user through to developers, and so far they have done this well. Calendaring might be a very crowded space, but 30 Boxes have managed to distinguish themselves well and I would rate them as the best contender to take on CL2 when it is released by Google. 30 Boxes are constantly releasing new features and improvements which you can keep up with at their blog.